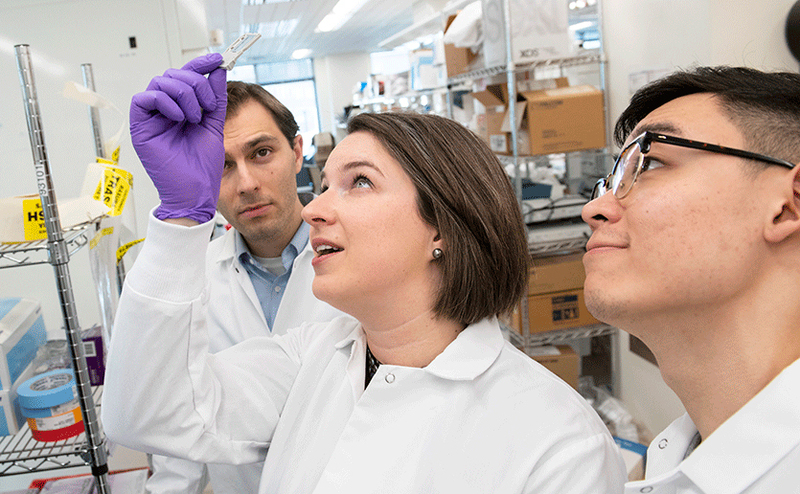 Seeking ways to prevent and treat immunotherapy side effects are Alexandra-Chloé Villani, PhD, (center), Daniel Zlotoff, MD, PhD, (left) and Kasidet Manakongtreecheep. Working at the forefront of developing new immunotherapy drugs for cancer, clinicians and researchers at the Massachusetts General Hospital Cancer Center are collaborating to solve the problem of immunotherapy side effects with a first-of-its kind service. Immunotherapies, which harness and enhance the body’s own defenses to kill cancer cells, have revolutionized the treatment of some forms of cancer. These drugs, known as “immune checkpoint inhibitor immunotherapies,” are providing new hope for many patients. But these drugs can trigger patients’ immune systems to overreact. They attack healthy cells, sometimes causing dangerous side effects known as immune related adverse events or irAES. Recognizing the urgent need to reduce the impact of these side effects on patients’ quality of life without reducing their cancer-fighting value, the Mass General Cancer Center created the multidisciplinary Severe Immunotherapy Complications Service. It brings together expertise from across the institution to identify and care for affected patients and to solve the mystery of these sometimes irreversible side effects. The clinical service was founded by Kerry Reynolds, MD, a physician and inpatient clinical director at the Mass General Cancer Center. She was moved to do so after her experience with one patient. Her patient, a successful businessman and loving father, was treated with an FDA-approved, two-drug immunotherapy combination to combat his late-stage metastatic melanoma. It caused an intense immune reaction and he was admitted to the hospital. “We tried everything in a desperate attempt to save this man,” Dr. Reynolds says, “But we never got control.” Sadly, he did not survive. His cancer was eradicated — the immunotherapy worked — but the side effects overcame him. Thankfully, such fatalities are rare. But immunotherapy’s toxic side effects are not; they affect 16 to 95 percent of patients, depending on which drug or drugs are used. The problems range from mild rashes to severe gastric complications and deadly heart inflammation. Mass General clinicians have treated thousands of cancer patients with immunotherapy. Controlling these side effects is a top priority. “The future of immunotherapy is in combining these drugs to treat our cancer patients.” Dr. Reynolds says. It is important to act fast to understand the biology behind these side effects and develop new treatments to limit their impact, she says. With Dr. Reynolds’ galvanizing call to arms, Mass General assembled a team of 41 doctors and scientists from 22 different areas of the hospital. Team members identify patients who are suffering from side effects and work as a multidisciplinary team to offer the best possible cancer care. They also coordinate an educational series to inform other clinicians about rapidly unfolding ways to manage these patients. Mass General is uniquely positioned to provide this kind of coordinated care and translational research effort. It is not a stand-alone cancer center, but a world class general hospital. When a patient is admitted with possible side effects, oncologists work side by side with expert cardiologists, gastroenterologists, dermatologists, and other specialists to treat side effects that can affect multiple organ systems. Researchers in the Villani Lab include, from left, Daniel Zlotoff, MD, PhD; Kasidet Manakongtreecheep; Molly Fisher Thomas, MD, PhD; Alexandra-Chloé Villani, PhD; Leyre Zubiri, MD, PhD; Mazen Nasrallah, MD. Alexandra-Chloé Villani, PhD, is an expert in human immunology and single cell genomics. By breaking down the science to the level of a single cell, her team is working toward solutions to avoid side effects and individualize care to meet the specific needs of each patient. For each patient treated by the Severe Immunotherapy Complications Service, Dr. Villani and her team analyze blood specimens and tissue samples collected before and after immunotherapy, and when side effects begin and end. They use state-of-the-art genomics technologies and immunological approaches to try to identify the cause of the problem. One of their goals is to find biomarkers that would identify, in advance, patients who are likely to develop severe side effects to immunotherapy drugs so that different treatments could be used. In addition, they are working to find new theraputic solutions to better manage side effects when they do occur. Philanthropic support is needed. With additional funds, they could analyze more samples and map which cells and molecules are fluctuating along with disease progression or remission that could become good targets for therapy. “Right now, we’ve only analyzed about a tenth of the samples we have,” Dr. Villani says. Increased funding for analyzing samples would allow the work to move more quickly into clinical trials assessing new therapeutic solutions that would help control these dangerous side effects and improve immunotherapy drugs’ efficacy. This research could have broad implications. “What is so striking about these serious side effects,” Dr. Villani says, “is their similarity to autoimmune diseases, suggesting they might share molecular underpinnings.” Learning more about these immune reactions might also help find treatments for autoimmune diseases like rheumatoid arthritis, diabetes or inflammatory bowel disease. For more information about the Severe Immunotherapy Complications Service or to make a donation, please contact us.